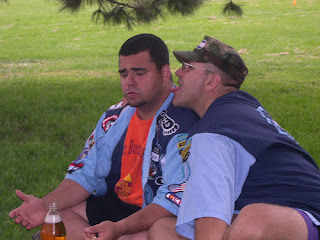 I've got a friend at work who has told me of a group of people who get together on Sunday afternoons and drink cheap beer and play kickball at Vermijo Park in Old Colorado City. They form up around 2:30 PM and it is very disorganized. They usually have about 10-15 people show up. Sound familiar? I figured it would be fun, and if anything, it would be a great place to meet some people who might be interested in hashing.... any takers? I can't do it this Sunday, but maybe the next one? 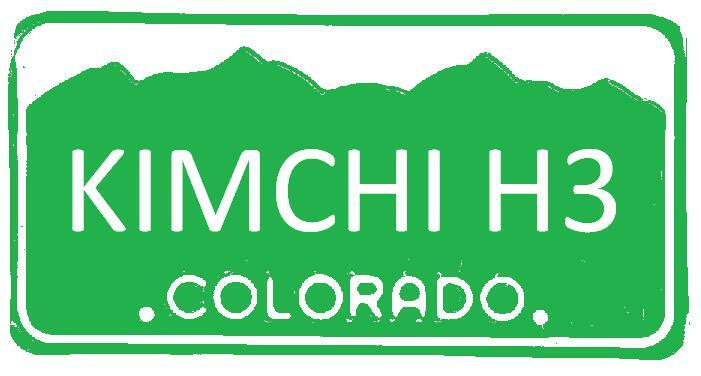 Pike's Peak H4 Hash Hared by Kimchi Hasher! Bring: $ Hash Cash, whistle, a little extra beer money just in case, shag bag, a thirst for SHIGGY, band aids (I said there'd be SHIGGY), a bottle opener, virgins, your mom (if she's Hash friendly), ping-pong balls in case you want to play beer pong at the second beer check. Directions: From Academy, turn East on Platte, then left on Murray. Bar is 1/2 block up on the right. From Powers, head West on Platte, turn right on Murray. The bar should be in the same spot unless the Kimchi get there first. * What: THE BUM WINE HASH!!!! * Directions: Head East on Colorado - Red Rock Lounge is at the corner of 31st and Colorado in the strip mall. If you're heading West on 24, turn right on 31st, left on Colorado, the left into the parking lot. 1. Next hash; Lick My Lincoln ... please verify! When is the next open hash date? Except the 29th? I have a good trail idea. No gimmicks, just a great trail with about 3 beer stops. Check it out! It's not very long, but hey...you can play in the pool or hot tub. Article is here. True aficionados understand that beer pong (sometimes known as Beirut) is not just a sport, but a way of life. Portable pong tables are widely available, but they can't go everywhere. Which is why the enterprising young men at PortOPong invented the inflatable beer pong raft, for use in pools and at the beach. The raft costs $50, which is pricey compared to similar "pool mattresses." 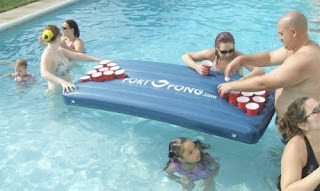 But for the millions of young Americans who are serious about beer pong, price is no obstacle. We predict that this simple invention will become very popular. Because nothing is more fun, or less dangerous than swimming drunk. Edit: Sorry, it says #110 in the picture, but that was the last one. Yet another Tex Mex memory!!! Just Sean's pictures are here.